Advertisement management is easily one of the most requested add-on features for phpBB. In phpBB 3.0, EXreaction’s Ad Management MOD was the 9th most downloaded MOD with over 66,000 downloads. For phpBB 3.1/3.2, community members ranked Ad Management as their 2nd most desired extension. The Extension Development Team at phpBB is happy to announce that we will be releasing an official Advertising Management extension for phpBB 3.2, created during our participation in the Google Summer of Code. The extension developed by GSoC student Senky (see his code commits) and mentored by VSE and Derky covers most features board admins would need to implement ad code snippets or sell advertisement space on their boards. At its most basic usage, an admin can paste HTML/JS code for an advertisement directly in ACP and select locations for this ad to display (14 locations are already available – along with pop-up and slide-up options). The ad will start to display immediately after it’s enabled. We’ve built into this extension various extra functionalities to help manage your board’s ads. 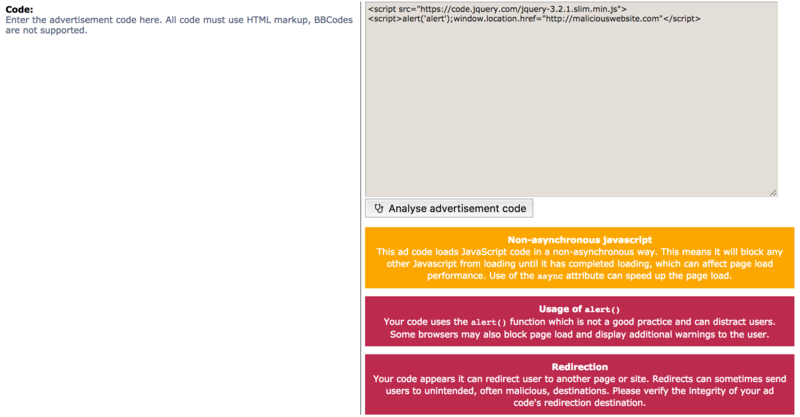 You’re able to set a comment for each advertisement (i.e., info about advertiser, PPC, etc…). Set the priority level of the ad (ads with higher priorities will be displayed more often than other ads assigned to the same display location). Set a user as an owner of an ad, who is then able to see ad statistics in the UCP. Set an expiration date for an ad, after which the ad will automatically be disabled. The extension can analyse advertisement code for you, to check that your advertisement code is secure, optimised and safe to publish. You can also take advantage of the built-in banner upload mechanism to easily upload and create banner ads without having to use FTP or leave the ACP. In addition to all that, the extension is able to count views and clicks for each ad, and optionally disable ads once they reach a certain number of views and/or clicks. If you designated an ad owner, they will be able to view their ads views and clicks stats in their UCP. You can also disable advertisements from displaying to selected user groups, for example to allow your admins, moderators (or even registered users) an ad-free experience. We’ve also included an ad-blocker detector option that will display a polite message to users to consider disabling their ad-blocker on your site, in order to help support your site. We did our best to optimise this extension for even the biggest boards – this extension performs only one additional database query (two with view counting enabled) per page load. However, we really look forward to your personal experiences with this extension to help us improve the performance and usability even more. This extension is not feature-frozen. We appreciate every comment, idea and bug report and will do our best to make this extension as powerful as possible without compromising performance. You can track our continuing feature/planning list on Trello. We wish you the greatest revenues! This extension is designed with extensibility in mind. Currently, it is already possible to accept new template locations defined in other extensions. If you have ideas on how to further extend this extension or would like to develop a rejected feature as an add-on to this extension, please ask us for any PHP/template events you may need us to add and we will be more than happy to prepare them for you. The extension is now available for download from our Customisation Database!